A site dedicated to my games... and more! I'm a game developer since 1990, and i worked on a lot of platforms during my life: Commodore 8-bit, Amiga, Windows, PalmOS, and finally iPhone! In this site you can find some of my games (I hope to add more of them) and some technical files, related to Commodore 8-bit and Amiga machines, I collected during the last 20 years. I hope you'll find some of them interesting, and please feel free to write me to ask information about them. I decided to create the site in English because this will allow a worldwide audience, but I'm from Italy, so you could find some files in Italian language, or related to Commodore and Amiga in Italy. Where not otherwise indicated all downloads are in English. My Iphone games & applications! The Ancestral Trail ('La Storia Ancestrale in italian) was a partwork magazine that was originally published by Marshall Cavendish in the United Kingdom, Australia and New Zealand in the early nineties. It was also translated into French, German, Italian and Spanish. The story tells the fantasy/sci-fi filled story of a boy called Richard, who is brought against his will to a strange land known as the Ancestral World. This original 26 part series was extended, and Richard's adventures continued into a futuristic world known as the Cyber Dimension. 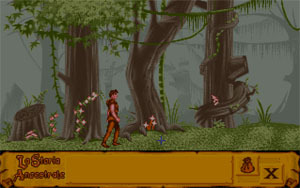 Hobby & Work, the Italian publisher, planned to create an interactive adventure game for MS-DOS & Amiga platforms, and assigned the development to Holodream Software. Short after I received all the issues of the story (they had to be published weekly) and started to write the game concept. I really didn't received anything else than the original story from Hobby & Work. I started from scratch and designed the games, adapting the story to four adventure games. Raffaele Angius was the programmer for the MS-DOS version, and I was the programmer for the Amiga version. YES, it's true! There was an Amiga version, but this platform was going out of the market, so it was never published. Warning: You need to understand Italian to solve puzzles. This is a third-person racing game featuring Formula 1 cars and circuits. This game was heavy inspired by the great Lotus Turbo Challenge game. We played it a lot, so we decided to create a F1 version. There are two gameplay modes, Arcade and Normal - in Arcade mode you have to finish in the top 3 each time, whereas in Normal mode you accumulate the appropriate points, irrespective of one or two bad results. There are 3 difficulty levels, and the number of laps is variable. 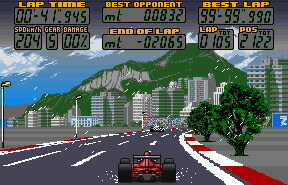 The game includes 22 cars (you can choose between cars very similar to Ferrari, Williams, McLaren and Benetton), and contact with these (or with the kerbing or roadside barriers) inflicts damage on your car. This may get bad enough that you have to pit for repairs (if you don't make it to the pits and have more contact, you may get forced out altogether). The game was initially planned to be released with Genias, but Raffaele Valensise (the project manager) shown a demo to ECES and got the attention of several "big names". So the game was eventually released by Team 17 (more than we could ever hope). Use UAE to play it! The game concept was born when the WWF Wrestling TV show was at the zenith in Italy. Raffele Valensise told me we should create a "Blockbuster", so we dropped a simple platform game called "Alien Hunter" and started withe the development of this classic beat-em-up. We taken a lot of ideas from the TV Show, where the anchormen Dan Peterson (aka Ted Hutchinson in our game) excited the crowd and was very ironic. Most of the characters resemble famous wrestler of late '80s and some other famous pepole (like a "young" Saddam Hussein). The game was published by Genias and didn't sold very well, probably because we had poor marketing but, hey, it was my first game!!! Please note that all content posted here is either created by the owner of the site or believed to be in the public domain. You are allowed to copy, reproduce or re-post the content without restrictions. If a file has been mistakenly published without permission of the owner, please contact me, and I'll be happy to comply with your wishes.